This article is meant to be a general overview of the Rhode Island LLC formation process; including information about how to start a Rhode Island LLC and other basic issues related to Rhode Island LLCs. The Rhode Island filing fee for the Articles of Organization (to create an Rhode Island LLC) is $150.00. If you would like to file online, an additional $6.00 will be charged. Regular processing time generally takes less than 30 business days. Rhode Island LLCs are required to file annual reports between September 1st and November 1st. The annual filing fee is $50 with a $25 late penalty that will come due if the annual report is not filed by December 1st. The first step in creating an LLC in Rhode Island is naming your business. You’ll need to check with the Rhode Island Department of State to make sure the name you’ve chosen is available. You can do this online via the Rhode Island Business Search. It is also highly recommended that you check the US Patent and Trademark Office to see if someone has a federal trademark of the business name you want (the Rhode Island Department of State will not check other state’s databases or the federal trademark database). You can click here to have a comprehensive name availability search performed for you. Your LLC name must contain the words “limited liability company” or the abbreviations “L.L.C” or “LLC”. A fictitious name is similar to a “doing business as” (DBA) name. Although a fictitious name is not legally required, it is a wise business practice. Fictitious names expire upon the filing of a Statement of Abandonment of Use of Fictitious Business Name or upon the dissolution of the applicant entity. The filing fee is $50 plus a $2.50 charge if filed online. Rhode Island fictitious names are only applicable in Rhode Island and are not substitutes for a national trademark filing. Your Rhode Island LLC is formed by signing and filing Articles of Organization with the Rhode Island Department of State. You can also e-file the Rhode Island Articles of Organization. The Department of State staff will examine the articles for statutory compliance and will either approve the articles for filing or reject the articles with instructions on how to resubmit the document. Rhode Island requires that the LLC have a Registered Agent/Office, which is an individual or a business entity the LLC appoints for the purpose of accepting service of process (lawsuit papers or legal documents) for the LLC. Rhode Island law requires that the Registered Agent have a permanent, physical address on the records of the Rhode Island Corporation Commission at all times. What each member is contributing to the LLC and what happens is such contributions are not made. The authority of the members, officers, managers, committees, etc. One of the reasons we recommend using an LLC formation company like IncFile is that they can provide you with a company agreement in connection with their LLC formation services. Apply Online Yourself: The IRS has an online EIN Application you can use to get an EIN. The turn around time on the EIN using this method is only a few minutes. Use Form SS-4: You can get an EIN the old fashion way by completing Form SS-4 and mailing or faxing into the IRS. How long does it take to get the EIN this way? According to the IRS: if you mail in Form SS-4, it will take 4-5 weeks to get your EIN. If you fax in Form SS-4 you should have the EIN back in a week if you provide a fax number or 2 weeks if you don’t have a fax number. Have a Third-Party Obtain: All of the LLC formation companies have the ability to get the EIN for you. The EIN obtainment charge varies by company, but it is generally between $50 and $100. If you get one of the higher priced packages, they will sometimes throw in the EIN for free. After you create your new Rhode Island LLC, you’ll need to determine if your business/profession requires any licenses or permits to conduct business. If you have a non-Rhode Island LLC (aka Foreign LLC) and you are doing business in Rhode Island, you may need to register the Foreign LLC in Rhode Island. Each state has a different definition of “doing business”. In Rhode Island, the kinds of activities that would not constitute “doing business” are outlined in the The Rhode Island Limited Liability Company Act, Section 7-16-54. The filing fee for the Application for Registration for a Foreign LLC in Rhode Island is $150. Use an LLC formation service like IncFile to help you form an LLC in Rhode Island. 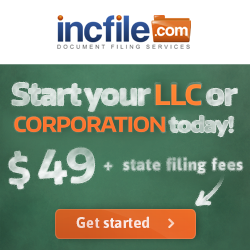 They have LLC formation packages starting at $49 (plus the state filing fee).